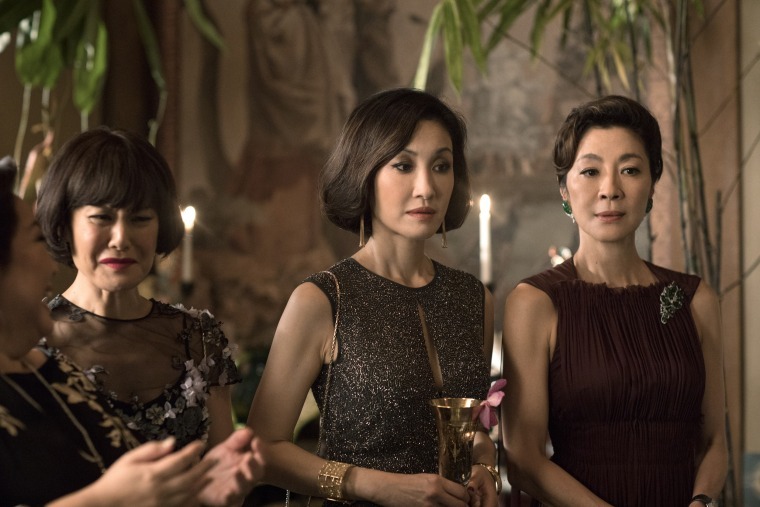 The mothers of “Crazy Rich Asians” are not defined as tiger moms or immigrants, and the film's actresses say blurring those lines is also representation. Unlike the mothers in fellow book-to-film adaptation “The Joy Luck Club,” which hit theaters 25 years ago, the women of “Crazy Rich Asians” are not defined as tiger moms or immigrant moms, traditional or assimilated. And according to the actresses who brought these women to life, blurring those lines is another form of representation. “In ‘Crazy Rich Asians,’ you’re going to see a really wide palette of different mothering styles from Asian mothers,” said Singaporean actress Tan Kheng Hua, who portrayed Kerry Chu, mother of actress Constance Wu’s Rachel. “Any presentation of variety just presents more details, and more details is really the way to fight stereotypes, because then you are offering audiences greater information to come up with their own conclusion about what they identify with, what they think is right, what they want to do, what they would like to or what they believe in, and their own values,” Tan added. The actress said the relationship between character and Wu’s was like the one between her and her own daughter: a closeness that “may seem very Western in that rather than the sort of parenting style that dictates and tries to organize children’s lives, Kerry actually comes down to Rachel’s level and relates to Rachel as an individual in her own right,” Tan said. In contrast, Michelle Yeoh’s Eleanor Young and Janice Koh’s Felicity Young are “more old-school” in the way they view parenting, Koh said. While Eleanor defers to her critical mother-in-law on how to raise her son, Felicity does “parenting by discipline, parenting by control” for her daughter, Astrid, portrayed by British-Chinese actress Gemma Chan. “Rather than anything to do with race, it’s the circumstances that influence the decisions made,” added Amy Cheng, who portrayed Jacqueline Ling, the mother to Amanda, an ex-girlfriend of leading man Nick. The film also includes a “supermom,” as Singaporean actress Koh Chieng Mun described her character, Neenah Goh, the mom of Awkwafina’s Peik Lin as well as a grown son, two young twin girls, and three dogs. For Koh, playing a “not very well-educated Singaporean” who wants everything Singapore was and is for her children wasn’t difficult — she just drew on her experience with her own mother. Ultimately, motherhood and parenting across cultures and for rich and poor have more in common than many may realize, Janice Koh said. “Sometimes this culture of controlling their kids and who they marry then gets passed down from generation to generation, which is not necessary, but it’s what you see reflected even in the monarchy and the royal family,” she said. “But there is a time and place and context where it has to be brokered and that is what Eleanor does by the end of the movie and that’s wonderful: She listens and she admits and submits." CORRECTION (Aug. 28, 2018, 5:31 p.m. ET): An earlier version of this article misstated the last name of an actress in "Crazy Rich Asians." She is Amy Cheng, not Cheung.CORRECTION (Aug. 29, 2018, 5:52 p.m. ET): An earlier version of this article misquoted Amy Cheng, an actress in "Crazy Rich Asians," about not calling Caucasian mothers "tiger moms." She said she had lived in Perth, Australia, for a while, not Paris.